If you look for “distributed lethality” in doctrine, you won’t find it. It’s a concept that exists in articles, speeches and panel discussions, which paint the topic with broad strokes – easy to understand, but leaving plenty of room for forums like this one to flesh out details. 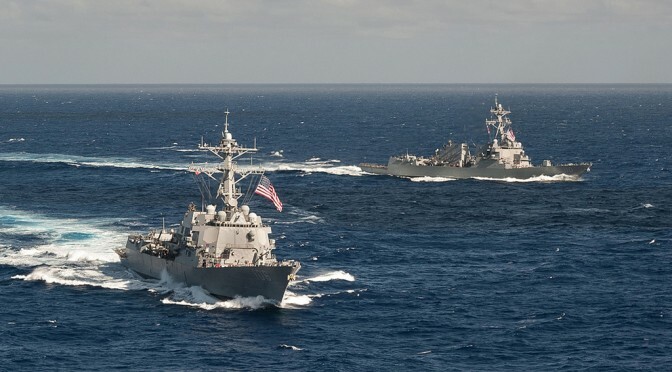 Tempting as it is to think about a few Surface Action Groups (SAGs) heroically dominating the contested maritime battlespace with SM-6s hitting everything from FFGs to ASBMs, distributed lethality remains just one part of a larger joint fight. Distributed lethality, so far as it has been articulated, closely follows the Joint Operational Access Concept (JOAC). So far, distributed lethality resembles JOAC with naval characteristics, but JOAC keeps on going where the conceptual sketch of distributed lethality trails off. Distributed lethality, as a naval variation on a joint concept, should follow the conceptual path already beaten by JOAC. Distributed lethality, like JOAC, requires reliable communications between sensor-shooter nodes. The ranges between distributed units and the bandwidth requirements for responsive C4I and lethal, cooperative targeting will drive communications onto SATCOM nets, networks that remain vulnerable to anti-satellite missiles, directed energy weapons, and cyber-attacks. GPS and intelligence satellites face the same threats. JOAC recognizes this vulnerability, and directs the joint force to “develop systems, technologies, and warfighting techniques to ensure continued freedom of action and access to space, cyberspace, and the electromagnetic spectrum when and where needed.” Lacking that freedom of access, the implications are clear and dire for distributed lethality: the enemy would attack the distributed fleet sequentially, as it located ship groups, with locally massed fires. The distributed fleet, unable to communicate, could only respond with uncoordinated counterattacks. Sending a divided fleet with nothing but locally organic sensors and weapons deep inside an enemy threat WEZ courts disaster. In order to effectively implement distributed lethality, robust and resilient supporting networks are absolutely essential. 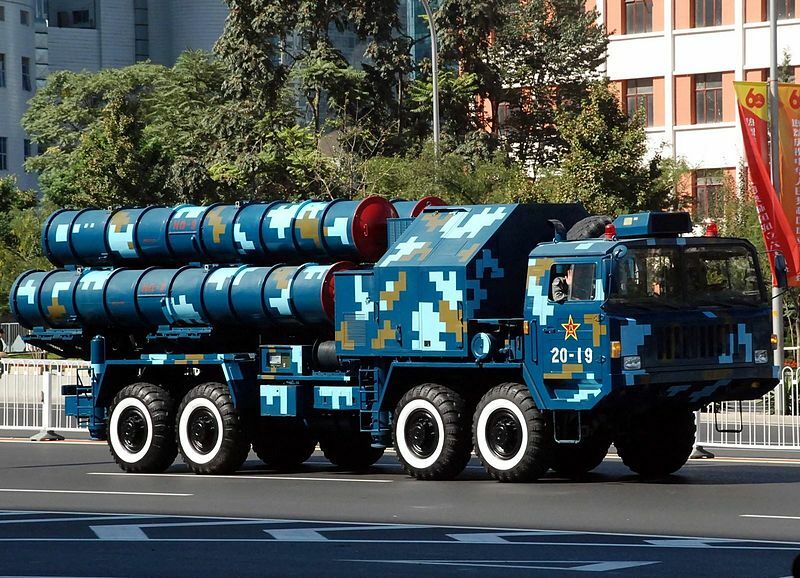 Chinese HQ-9 TEL on parade. Satellites face the same persistent threat that prompted the concepts of JOAC and distributed lethality to begin with: the presence of friendly critical vulnerabilities inside the threat WEZ. The solution remains conceptually similar: increase the capability, type and number of available platforms such that the enemy never has the capability to decisively target and neutralize friendly critical capabilities. To that end, what naval “systems, technologies, and warfighting techniques” could change the sudden loss of our most important space-based assets from a travesty to a moderate inconvenience? The remainder of this piece will depart the broad conceptual discussion and dive down to some very tactical level solutions. Rather than present the killer app, silver bullet or what have you, I’ll briefly introduce a few capabilities that could take the sting out of losing the most important satellites in a region during the opening salvos. CosmoGator mitigates the loss of GPS by automating celestial navigation fixes and feeding them into the ship’s inertial navigation system, enabling weapons quality tracks even in a GPS denied or degraded environment – provided the stars remain visible. As anyone who has tracked a submarine with sonobouys can appreciate, imprecision in the sensor location yields imprecision in the target track and targeting solution. Adding the capability to track non-U.S. commercial SATNAV constellations (Galileo, GLONASS, BeiDou, etc) would add navigational and time/time-interval redundancy to naval platforms. The targeting of U.S. navigational satellites should be a forgone conclusion, but targeting satellites of non-belligerent states is anything but. Currently, communicating within a SAG is relatively easy, but at the cost of a very distinctive electronic signature. Distributed lethality requires low-observable and low-probability of attribution communications within the SAG. First, low-attribution communications means taking existing commercial waveforms and using them to replace distinctively military signals. A DF scan for 2.4/5 GHz 802.11, CDMA, LTE or GSM signals in most contested areas would be overwhelmed by emitters. Coastal residents, merchant mariners and local fishermen tend to use these signals rather a lot without much concern for EMCON. Coupling these frequencies and waveforms with stabilized, high gain directional antennas would enable high bandwidth, low-latency line-of-sight communications within the SAG while maintaining the electronic signature of a freighter or coastal village. When sneaking through a forest of transmitters, it’s best to look like a common electronic tree. In an update on flashing light Morse signals, the ONR project for High-Bandwidth, Free-Space Optical Communications is designed to support Marines at austere FOBs, but could also offer unimpeded communications in a highly attenuated – and therefore difficult to intercept – part of the spectrum. Like celestial navigation, meteorological conditions may occasionally preclude this method, but for the rest of the time, it’s a good way to complicate enemy targeting. Finally, better integration of automatic level control – adjusting transmit power based on signal-to-noise ratio (SNR) and signal-excess – could do much to reduce the probability of detection for existing RF transmitters. Only transmit the power required to reliably reach the ship 10 miles away, not the ELINT aircraft 400 miles further. I’m not the first to think about making elevated nodes like satellites a bit more redundant for communications. DARPA and ONR have been developing the Towed Airborne Lift of Naval Systems (TALONS), a towed shipboard parafoil system capable of lifting a 150 pound payload to 1,500 feet. Unlike most aircraft (manned or unmanned), a towed system can remain aloft for days on end. Improving on the system that well-tanned parasailing operators have been using for decades, DARPA has made an automated launch and recovery system. In the context of distributed lethality, ships such as the LCS and EPF (formerly JHSV) could serve as communication nodes for ships with long-range weapons. The Air Force has been using the Battlefield Airborne Communications Node (BACN) for years as a communications Swiss army knife to connect disparate platforms, waveforms, and standards. The technology is platform agnostic – the Air Force operates it from modified business jets (E-11A) and UAVs (RQ-4); the Navy could just as easily operate the system from P-8As or MQ-4s. TALONS and BACN have their appeal, but also their limitations. A radar horizon of roughly 50 nautical miles limits TALONS, and on-station time limits BACN and systems like it. Counter targeting is a common threat to both. Ideally, a satellite replacement would be close to disposable and not so closely proximate to a manned and/or difficult to replace platform like the LCS, EPF, P-8A or MQ-4. Which brings us to lighter-than-air unmanned vehicles. A Google Project Loon internet balloon in flight. Photo credit: Google. 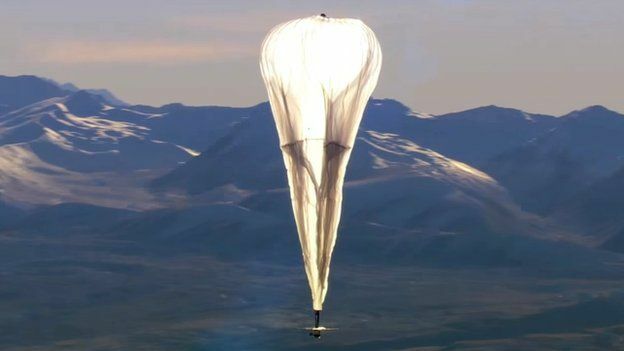 Google has deployed stratospheric balloons to bring internet services to remote locations, getting and keeping them on-station with altitude-picking algorithms. Similarly, the Navy could rapidly deploy very high altitude, very high endurance vehicles – atmospheric satellites – in the immediate aftermath of an attack on regional communications satellites at a lower cost and greater quantity than the enemy’s inventory of high-altitude missiles capable of taking them down. Much of the cost and difficulty of satellites is the launching part. Launching a balloon from a ship consists of setting a course and speed for minimal winds, opening a valve to a helium tank and assisting the inflation with a crane and a crew of deck handlers – hardly rocket science. Any naval platform with a flight deck could launch balloons on demand to fill in for neutralized satellites or to quickly add more C4ISR capabilities. While the time on station of roughly 100 days can’t match a satellite, it exceeds the state of the art for heavier-than-air vehicles by an order of magnitude. It’s quite possible, even likely, that none of the particular solutions above have any place in the Navy’s future. I hope that the unifying theme, however, resonates: pragmatic over exotic, commercial off-the-shelf over bespoke military kit, and integration within a larger joint effort rather than a service specific attempt to win the next war singlehandedly. Collin Fox is a Western Hemisphere Foreign Area Officer (FAO) assigned to U.S. Fleet Forces Command. In his former career as a SH-60F and MH-60S pilot, he flew over 1,400 flight hours and conducted three life-saving rescues. He earned a Master of Science degree in Systems Analysis from the Naval Postgraduate School, where his final project won the John Hopkins Applied Physics Lab Award for Excellence in Systems Analysis. The views expressed here are his own.